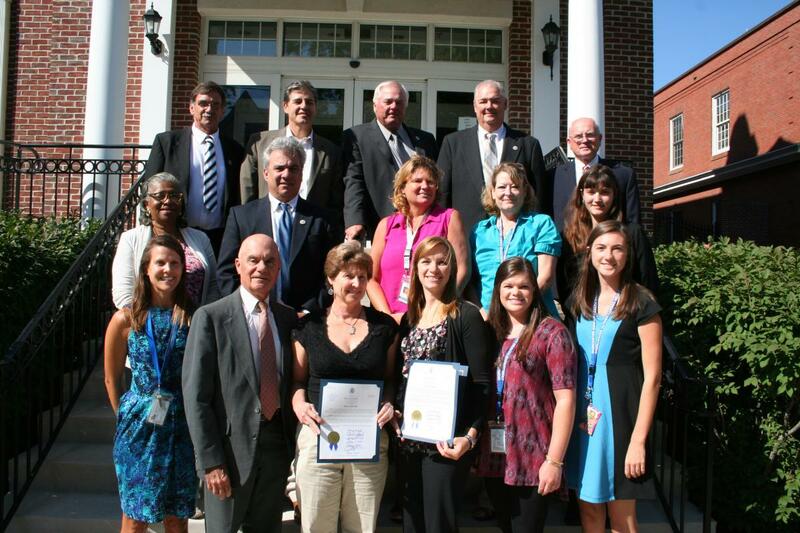 September 6, 2016 – the Commissioners joined with representatives from the Worcester County Health Department and Jesse Klump Memorial Fund to recognize September as National Suicide Prevention Month. Those pictured include Caroline Green (front row, from left), Ron Pilling, Kim Klump, Jessica Sexauer, Olivia Holland, and Erin Wooten; and (second row, from left) Commissioners Diana Purnell and Chip Bertino, Monica Martin, Jennifer LaMade, and Brittany Lawton; and (third row, from left) Commissioner Ted Elder, Steven Taylor, and Commissioners Jim Bunting, Joe Mitrecic, and Merrill Lockfaw. Health Department, staff, in partnership with representatives with the Jesse Klump Memorial Fund, strive to end the secrecy in which suicidal thoughts play on a person’s mind by educating caring individuals to recognize the warning signs and take action to save a life. Learn the signs and risk factors for suicide at http://worcesterhealth.org and http://choosetolivemaryland.org and take part in the Out of the Darkness Walk to Prevent Suicide Saturday, Sept. 24, at Caroline Street and the Boardwalk.